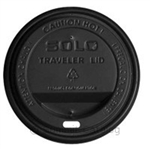 The Solo Cup Company provides us with a full complement of hot drink cup lids that you have access to here at Round Eye. These include the well-known coffee cup lids used by many to-go coffee providers as well as a wide range of other paper cup lids with which you're likely familiar. Traveler lids for hot beverages being consumed on the go have an inner ring to reduce instances of the lid popping off, and travel dome lids leave that extra room needed for foamy or other gourmet hot beverages. Buy in large wholesale lots of 1000 lids or smaller counts of 300. Lids are available for various sized cups, from 8-oz to 20-oz. Several drink-thru lids will fit as many as five different sized cups.